LOOKING AFTER YOUR AIR FILTER. The filter element is right at the heart of your RacingLine intake. It’s a specialised, hand-made part developed for high performance and motorsport use. And, as with all the other parts on your car, the filter element deserves to be well looked after and be a part of your regular maintenance schedule. Our Oil and Cleaner Kit (below) will help you keep your filter in peak condition at all times and ensure that the complex triple-layer foam continues to deliver its power and filtration benefits for many years. We have provided instructions on cleaning and maintenance below. It’s a simple process, but please take time to read through, or ensure that your technician reads them, before you begin. We would suggest that you keep these notes with your car for future maintenance/owners. ​If you don’t clean your filter at the above intervals, no loss of filtration will occur, and your engine will still be fully protected. However, the performance advantages from the additional air flow of a clean filter will be lost. You will also shorten the life of the filter element. This RacingLine Oil and Cleaner Kit is essential to help you keep your filter in peak condition at all times and ensure that the complex triple-layer foam continues to deliver its power and filtration benefits for many years. It’s important that only this Oil and Cleaner Kit are used, as they’ve been specially formulated to work with our foam air filter material. Like all the other filters on your car, it’s worth replacing the air filter element itself periodically. Rather than cleaning and re-oiling, lots of customers prefer to simply replace their filter element for what is a relatively low cost. ​We recommend replacement after 2 years for optimum performance. Of course, the filter will last for a longer period of time with correct maintenance and inspection for condition of foam as laid out below. Air Filter kits are of great importance in providing the engine with the cleanest and correct volume of air. They should therefore be fitted and maintained with the utmost care and attention. Please make sure you have read and understood the process before starting on this. If you are in any doubt, it is recommended that this work is carried out by persons possessing the necessary expertise i.e. a trained vehicle technician. These instructions are for guideline purposes only and do not take into account any special features that may apply. Regional and model variances do occur across the vehicles that this part is intended for, which may lead to some minor differences between descriptions and pictures shown in this document. If in doubt please contact your distributor. 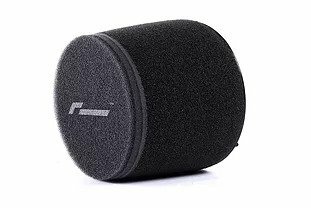 NEVER use an unoiled or dry foam filter in your vehicle as this will significantly reduce the efficiency and may allow small dust particles to pass through without being trapped by the dust retention oil. ​The RacingLine Foam Air Filter Cleaner has been developed to maintain our air filter elements and provide an accurate, even spread with the pump action spray system. The cleaning fluid removes old oil, grime and other residue from the filter prior to re-oiling. It’s designed to be used in a two-part cleaning process where the cleaner breaks down the sticky dust retention oil on the filter which is then washed off using warm water. As the fluid is water soluble it ensures that any over application can be removed providing an easier process. Spray the cleaner liberally onto the filter and thoroughly massage in. You need to ensure the cleaner has worked its way through all the layers in the foam and it may be necessary to apply extra cleaner until you are satisfied the cleaning fluid has fully penetrated the foam. To help the cleaner to break down the oil, it is advisable to leave the filter for 2-3 minutes and then further massage the cleaner into the foam. The next step is to wash the filter out in warm water. Thoroughly wash the filter until you are totally sure that all the cleaning fluid has been removed and the water running through the filter looks clear. It is also advisable to run water through from the clean side outwards to further help the removal of any dust still held within the filter. This stage of the process should take no more than 4–5 minutes. Note – leaving the filter submerged in water for a prolonged period of time may cause the glues in the filter to soften and eventually break down. Next follow the same process again using washing up liquid, this will help to break down any remaining cleaner still left in the filter. Apply a small amount of washing up liquid onto the filter and massage into the foam working it all the way through. Rinse the filter in cold water until none of the soap suds remain and the water runs clear; finally, shake the filter to remove excess water. Now the filter is clean you will need to leave it in a warm, dry place until is fully dried out for a minimum period of 24 hours. Do not use a high pressure air line or heat gun to speed the process up. You are now ready to move to step 2 of the process – reoiling the filter. DO NOT use the unoiled filter until after step 2 is complete. Under no circumstances use a highly alkaline cleaner above PH-8, such as powder based cleaners or a clothes detergent to clean the foam filter. Using a highly alkaline cleaner will breakdown the foam structure and destroy the effectiveness of the filter. If in doubt of what is safe to use, contact us for advice. Once you have completed step 1 – cleaning your filter – and ensured it is completely dry, you are ready to perform the important stage of reoiling it. 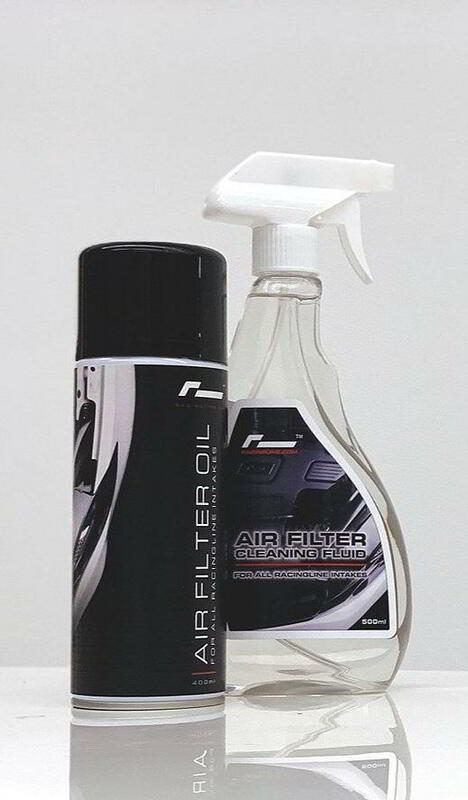 The RacingLine Foam Air Filter Dust Retention Oil Spray has been specially formulated for our foam air filters. The aerosol oil spray allows dust and particles to be retained within the foam media reducing possible impact of particles entering the intake system in the long term. The oil simply coats the foam filter and the viscosity has been developed to ensure the oil stays where it is required, on the filter and not be drawn into the intake system. Firstly, please read instructions and safety warnings on the product before use. Use in a well ventilated environment. Holding the aerosol about 25mm or 1 Inch from the filter, spray in a circular motion all over the foam surface until the coarse foam pores just start to fill up with oil. Then wearing protective gloves use your finger tips to ‘massage’ the oil into the depth of the foam whilst it still feels cold to the touch. The aerosol contains a mix of oil concentrate and thinners which assist the oil to penetrate into the foam. The thinners will evaporate off after around 5-10 minutes, so massage the oil into the foam as soon as it is applied to assist the oil in penetrating through to the fine inner layer of foam. Once the oil is applied leave the filter to air for at least 30 minutes. Your filter is now ready to re-install. If you think you have over oiled your filter, no problem, you can dab the surface of the foam with a strong absorbent paper tissue, which will remove most of the excess oil. Re-installation should follow the RacingLine fitting instructions. Under no circumstances use cotton gauze filter oil or any other oil not specifically manufactured for foam air filters because oil will not stick to the foam and thus may allow dust through the filter with the risk of causing damage to the engine and/or MAF sensor. It’s important that our RacingLine Oil and Cleaner Kit is used. However, if our kit is not available, there are two other alternatives. ITG’s cleaning kits or Rock Oil foam filter oil and cleaners can be safely used as an alternative. No other products for either the cleaning or re-oiling are suitable, and in many cases may lead to rapid deterioration of the filter material. Their use will unfortunately void your filter warranty.